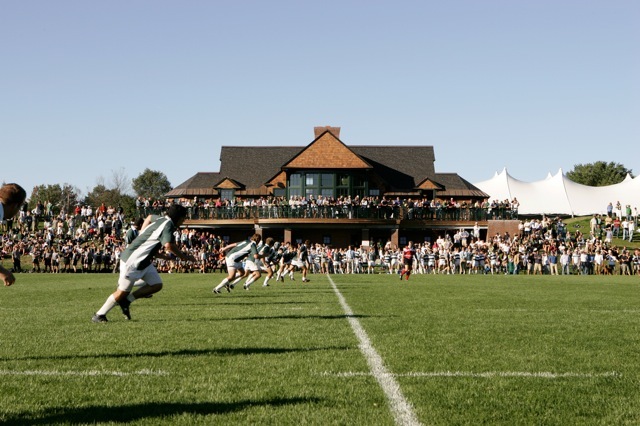 Stony Brook, NY – This past Saturday the Big Green sent two equally skilled Green and White squads to the first leg of the Empire Sevens tournament in Stony Brook, New York. The Green team started off the day with a strong 19-0 victory over Stony Brook B and set the pace for the next couple of hours, continuing to a 3 – 1 finish in pool play. Big Green victories continued with the White squad taking their first game 37-0 over Columbia and going undefeated in their next 3 matches, defeating Syracuse, Brockport and Stony Brook A.
Dartmouth Green and White teams celebrating a First and Fourth place finish at Stony Brook, NY. The DRFC would like to Will Gray, Dartmouth rugger and class of ’59, for making the participation of the Big Green in the Empire 7s tournament possible this past weekend. In addition, the squad would like to extend our gratitude to DRFC parents Mr. Levine and Mr. Sullivan for providing much needed food throughout the day to keep the boys fueled and competing at the highest level. Throughout the day, green team captain, senior Jake Levine, demonstrated great fortitude at sweeper and inspiring leadership, guiding his team to a 3 – 0 start. Levine made multiple game defining tackles against charging opponents and displayed the dexterity of his game and boot on a notable grubber into the try zone through looming Kutztown defenders. Despite Levine’s grubber and a determined goal line stand by the Green team defense, Kutztown scored a last minute try to end the game and Dartmouth’s hopes for a 1-2 sweep of the tournament. The Green team’s tough loss against Kutztown in the final match of cup play was not the last that Kutztown would see of Dartmouth on the day, however; their victory set up a Cup final against Dartmouth’s undefeated White Squad. Junior track crossover athlete John Abraham, who spent the winter touring South America with the Canadian Olympic development team, displayed his blazing speed early in the game, opening up the score by streaking untouched down the five-meter channel. Abraham continued his impressive individual effort with two more long runs for tries, putting the Big Green ahead to a decisive lead at halftime. Despite a quick try off the second half restart, Kutztown’s momentum was quickly dampened by patient and cohesive defense from Dartmouth’s White team. Seniors Andrew Berson and football converts Sean Ronan and Stephen Dazzo physically dominated the Kutztown side, throwing back multiple waves of attackers. Senior captain Peter Savarese displayed great versatility on the field, dominating rucks and drawing defenders before making nifty one-handed offloads. The White team finished the Cup final ahead 29-19, capping off a long, hard fought day of tournament play with some nice hardware. The Green team finished the tournament with a tough match against Stony Brook A, falling 45 – 0 in the 3rd and 4th place match. Despite the score, the fourth place finish offered a full roster of freshman starters the opportunity to gain important minutes against an experienced Stony Brook team. Throughout the day the commitment from the DRFC’s newest members bolstered the teams efforts and is an encouraging sign for the years to come. Standout freshman performances included long runs by Chris Nkoy, shifty speed up the middle by Benny Goodman and hard tackling and finishing runs by Ernie Pichardo.